After we’d lived in Cambodia a year, it was time to renew our auto insurance. Jonathan dropped off the documents at the insurance company office, and they were supposed to process them and return them to us. A convenient time for them to deliver the documents happened to be when Jonathan was at language school. 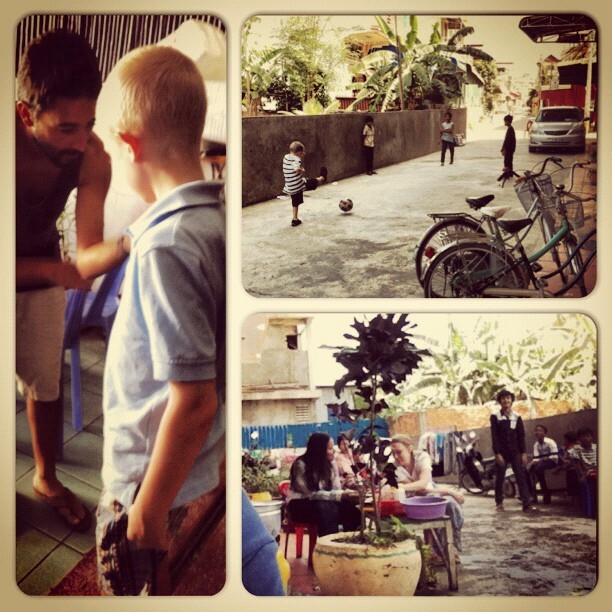 He gave them directions to our house (over the phone and in Khmer). The closest the delivery guy managed to get was the bank that is three blocks from our house. So it was up to me to get those documents from that delivery dude. When Jonathan called to tell me what I needed to do, I panicked. (Harm Avoidance alert.) “I can’t do that! I can’t leave the kids alone in this country!” He calmly instructed me to lock the kids in the house and run down the street to meet the insurance guy. Lock, and run. Now there’s something you should know about walking on my street. I don’t like to walk too far. Dogs are always wandering around, looking for food scraps in trash bags. We see and hear these dogs fighting all.the.time. And you all know how I feel about wild animals. So here I had myself quite the situation. I had to leave my kids alone in a foreign country. Not with-a-baby-sitter-alone. Alone alone. I had to walk down the street, past the place where the dogs congregate. Preferably hurriedly, since this guy was waiting for me at the bank. Deep breath. I had to do this thing. Thankfully the baby was sleeping in her room. I told the 3 older kids to stay in the living room for 5 minutes and play nicely. Mommy had to do something. The neighbors were outside playing as usual. An adult volunteer was playing with them. I locked my front door. Then suddenly, something clicked inside my brain. I didn’t lock the gate. I wasn’t worried. I didn’t even tell the neighbors I had to run an errand and was leaving my kids inside. These neighbors are always watching out for us. I trusted them not to allow an intruder to break into my house in broad daylight. I told myself: Lock, and run. No tuk tuks asked me if I wanted a ride, even though 2 of them passed me. No one stared at the white lady walking down the street in a hurry. (No one walks in a hurry here.) We are neighborhood fixtures now, not a novelty. But our neighbors might move away. Several months ago the owner of the row house next door posted a sign that he wanted to sell the house. He gave the renters a one-year notice. When Jonathan learned that, he was sad. When I learned it, I was a mixture of sad and happy emotions, but mostly, happy. Because they have lots of trash in front of the house. Because they are always cooking with fish and fish paste. Because they get in my personal space. Because they get in the way of our van when leaving or coming home. Our neighbors are my main way of engaging the culture. I don’t have a lot of easy or natural ways to engage the culture – we homeschool all day, and I’m no longer studying language full time. But when I leave the house on my errands, they are always outside, available for chatting. (Most of the people in our row house don’t spend much time outside; these neighbors, on the other hand, are almost never inside.) After we finish school each day, we go outside to play, and the boarding school kids are always around for my kids to play with. They’re usually making supper about that time, and we talk in Khmer with both the kids, and with the adults who take care of them. If they move, I will miss those times. When I was irritated by them, I didn’t really know them very well. As I got to know them better, I also got better at looking past the irritations. I forgot those irritations even existed. By the time of the Lock and Run escapade, I realized that I would no longer be happy about them moving away . . . not even a little bit. My neighbors are Good Samaritans to me. Blessings from an unexpected source. A source that may or may not always be with me. But one I’m nonetheless grateful for. Tame or otherwise, their bark is typically worse than their bite-w/American dogs anyway. Grin!! Best not to let them ever sense your fear though, dogs have a keen sense of smelling fear. Put up a strong fearless front and run on sister!! Thankful for you. Your posts bless me and I look forward to them!! Well here’s a story for you, Pam, about fear and dogs. The other day I heard the horn of the trash truck, which means we need to take our trash to the corner to be picked up. When I got there with the trash bags, the truck had already moved on. I didn’t think it would be a problem for me to walk further to drop them off, until I saw 2 dogs roaming through trash bags, between me and the truck! I looked at the trash bags in my hands, and then at the dogs. I was pretty scared. My grandfatherly neighbor was beckoning to me to take my trash to the truck, but all I could do was stand there in fear. I knew I would look silly taking my trash back in my house, but I just couldn’t walk down by those dogs! I stood frozen for awhile, and remembered how you said, put on a fearless front, and I just told myself to pretend they weren’t there, and walk by with my trash bags anyway. (Of course I waited till one dog walked to the other dog so they were both on one side and I wouldn’t have to walk between them, lol.) But, I did it. Scared as I was. Sort of an out of body experience, really, to be doing something so scary, but still to be doing it. . . Later I told my other neighbor, the one I talk with a lot. I told her I am scared of the dogs. She said she is too, she’s scared of dog bites. At least I know I’m not more scared than my neighbors!